This salad is full of flavor. I absolutely love it! It is great served with lettuce wraps. Remove seeds and ribs of the jalapeno. Peel garlic. 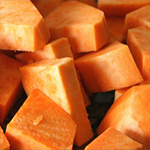 In a blender or food processor add jalapeno, garlic, soy sauce, brown sugar, peanut butter, and lime. Blend thoroughly. 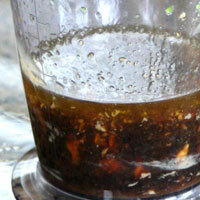 With the blender on, add the oils in a steady stream and blend until it thickens a bit. Mix in the red pepper flakes. Refrigerate until ready to use. 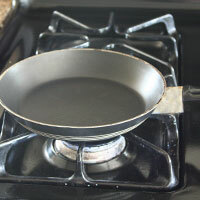 In a medium saucepan bring water to a boil over highest heat. Once it starts boiling add 2 t salt. 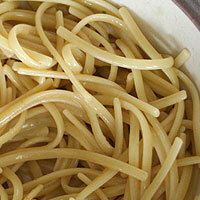 Break linguine noodles into thirds and cook according al dente. Strain and run cold water over it. Running cold water over the noodles stops the cooking and removes starches from the pasta. This is desirable in a salad, but not for a hot pasta dish. Transfer noodles to a small bowl and add a spoonful of dressing or a few drops of sesame oil to keep them from sticking together and to flavor them a bit. They can burn quickly so don't leave them unattended. 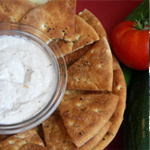 Fill a large bowl or salad spinner with cold water. Remove stems from cilantro and chop large. 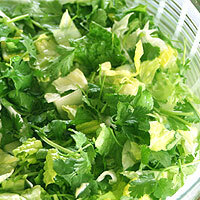 Chop lettuces into salad size pieces. 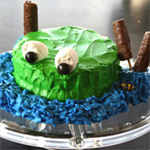 Place in water and gently swish to rinse. Drain the water and spin dry or dry on paper towels. Running tap water directly on the lettuce can bruise it and make it less crisp. Toss the greens with dressing. Top with linguine noodles and cashews. The most important thing is to dress the salad right before serving. If the dressing sits on it too long, it wilts and becomes soggy. Be careful not to burn the cashews. They roast quickly. The dressing won't be as good the second day because of the fresh lime juice. If you want to make it a day ahead, add the lime the next day. 1. 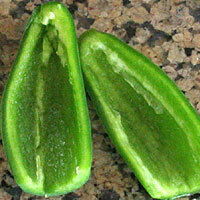 Remove seeds and ribs of the jalapeno. Peel garlic. 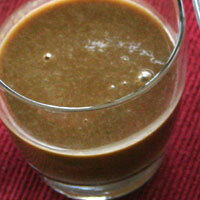 In a blender or food processor add jalapeno, garlic, soy sauce, brown sugar, peanut butter, and lime. Blend thoroughly. With the blender on, add the oils in a steady stream and blend until it thickens a bit. Mix in the red pepper flakes. Refrigerate until ready to use. 2. 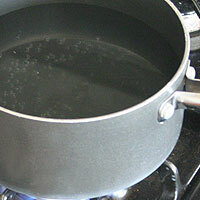 In a medium saucepan bring water to a boil over highest heat. Once it starts boiling add 2 t salt. 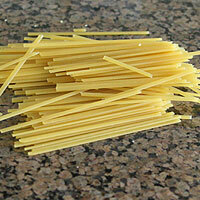 Break linguine noodles into thirds and cook according al dente. Strain and run (1)cold water over it. Transfer noodles to a small bowl and add a spoonful of dressing or a few drops of sesame oil to keep them from sticking together and to flavor them a bit. 3. Heat a small skillet over medium heat. 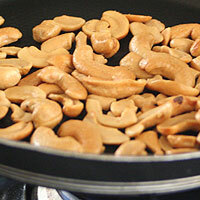 Add cashews and dry roast (2) stirring very frequently until very aromatic and beginning to brown about 5 minutes. 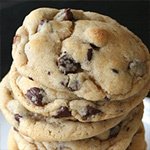 Set aside in a small bowl and cool completely. 4. 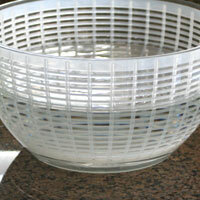 Fill a large bowl with a colander inside or salad spinner with (3)cold water. 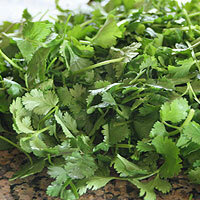 Remove stems from cilantro and chop into large pieces. Chop lettuces into salad size pieces. Place all in water and gently swish to rinse. Drain the water and spin dry or (4)dry on paper towels. 5. (5)Toss the greens with dressing. 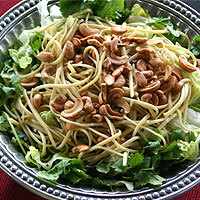 Top with linguine noodles and cashews. 1. 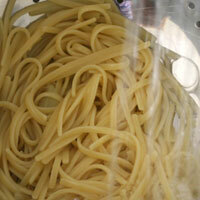 Running cold water over the noodles stops the cooking and removes starches from the pasta. This is desirable in a salad, but not for a hot pasta dish. 2. They can burn quickly so don't leave them unattended. 3. Running tap water directly on the lettuce can bruise it and make it less crisp.